A few months ago, just after Christmas, I went on this no sugar-kick. I even shared my plan and had tons of encouragement from you. First, thank you. It always helps to know you have someone rooting for you. Second, it was really hard. I removed all sugar from my diet, including fruit, starchy veggies and all sweeteners for almost three weeks. And yes, wine included. While I definitely felt good, it felt like something was missing. Maybe it was just my mind playing games with me, but I couldn't imagine living in a world with out sweets – let alone fruit. I caved when I visited my parents and I remember that first bite of fruit I took. Heaven. And it was an apple…just a plain old apple. It tasted amazing. I realized that fruit, and sweets, have a place in my diet, I just need to be mindful how much I'm eating them. I'm not going to sit here and say that I can eat an entire bar of dark chocolate and feel good. Or eat three bananas a day. But as long as I'm striking a balance between what my body loves – fruit and chocolate – and what it needs – green vegetables and lean protein – then it seems to find its rhythm. Now that I am paying more attention to the amount of sugar I'm eating, I've found that I'm satisfied with just a small bite. I don't need to eat three cookies to get my fix. I can just have a teeny square of chocolate, a raw cookie ball, or a chocolate-covered peanut butter ball. I've professed my love for chocolate and peanut butter before, but I have to say this particular treat takes it to the next level. 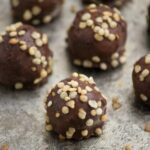 A healthier version of a Reese's Peanut Butter Cup, these little peanut butter balls are pure bliss. But what makes them even better is the addition of quinoa cripsies. 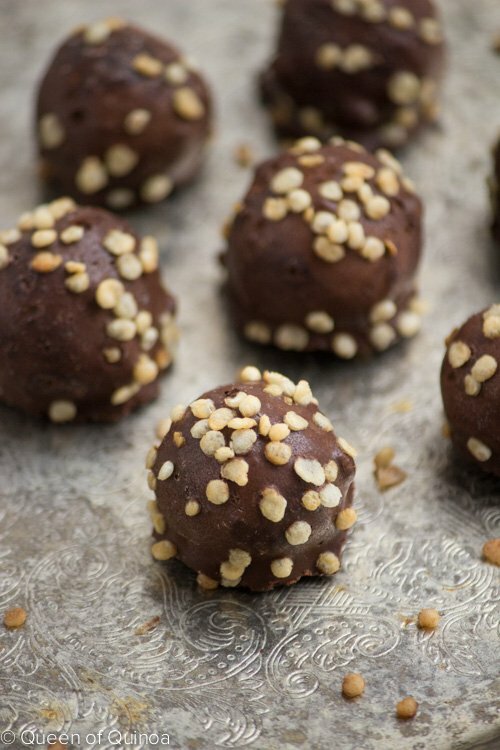 They go from just truffles into these sensation dessert/snack bites that kind of remind you of a chocolate crunch bar (or granola bar), but in candy form. Does that even make sense? Either way…they melt in your mouth, make your taste buds sing and are mostly healthy. I say mostly because yes, they're still chocolate and they're still peanut butter. But compare the list of ingredients here with what you buy in the check-out line at CVS, and I'd pick these peanut butter balls any day. For today's recipe, I've taken a slight adaptation from one of my all-time favorite bloggers, Angela from Oh She Glows, and turned it into a quinoa creation. Angela is incredibly talented, so if you haven't checked out her blog, you must! She also just released a cookbook (yay!) which arrived at my doorstep yesterday and I seriously was drooling over all the recipes. We're not vegan, but I can't wait to cook everything inside! I've professed my love for chocolate and peanut butter before, but I have to say this particular treat takes it to the next level. 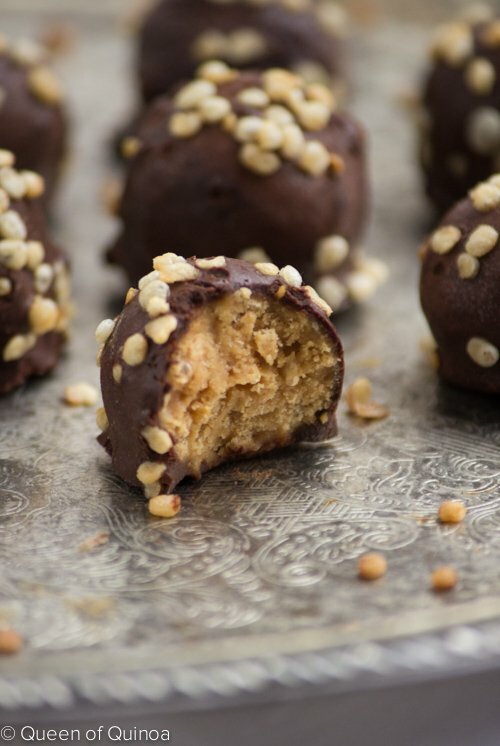 A healthier version of a Reese's Cup, these little peanut butter balls are pure bliss. Mix together peanut butter and maple syrup until fully combined and smooth. The mixture should thin out a little bit. Add coconut flour and quinoa crispies. Stir until peanut butter begins to thicken and turns into a dough. Roll 1 tablespoon of dough into small balls and place on a parchment lined baking sheet. Repeat until no dough remains. Set aside. Melt the chocolate and coconut oil over a double boiler until completely smooth. 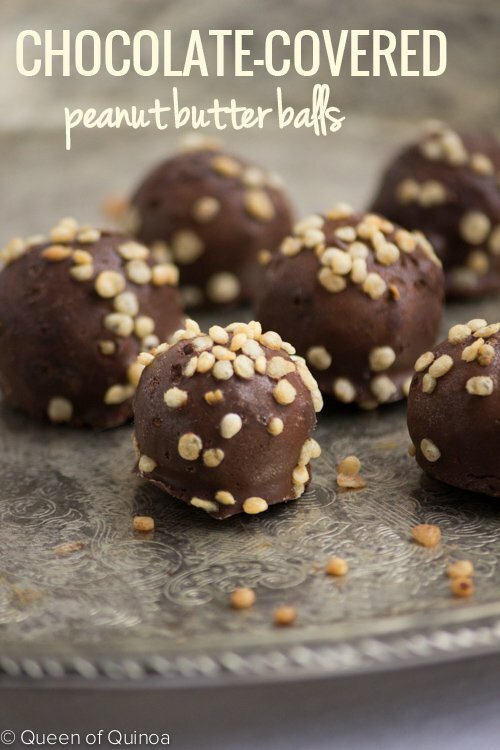 Using a fork, dip the peanut butter balls into the chocolate and return them to the baking sheet. Sprinkle with additional quinoa crispies for decoration. Place in the fridge for 1 - 2 hours, until chocolate has hardened. These are best stored in the fridge or freezer. Im thinking why cant you toast your own in coconut oil? I couldn’t find Quinoa crispies anywhere so I followed internet directions to make my own…poor results. I used crushed Rice Krispies instead – still delicious, but will try again. Hoping to find crispies in Buffalo next time we visit the US. Good morning Alyssa, I just wanted to tell you that I always look forward to receiving and reading your emails. I am a big fan of quinoa and love all these different recipes to incorporate it in my day. Also, I am a HUGE fan of peanut butter, in fact, I cannot imagine my life without it, ha ha. I am very excited because I am pretty sure I have found quinoa crispies in my local grocery store! If, not the regular, I have definitely found a chocolate cereal version of them in a local bulk item store. So, yay for me and I would also like to add that I am VERY excited to make these and send you the verdict! Have a wonderful day and here’s to warm weather and hopefully the snow disappearing! We are buried in it here. Edison Grainery does have Free Shipping with orders over $50! When I need quinoa cripsies, I just stock up on other goodies to reach $50! My kids LOVE their quinoa mac-n-cheese and one bag makes 2 batches (includes 2 cheese packets). Their other products are fabulous too! That’s understandable. I too don’t like paying shipping costs. If you can’t get your hands on quinoa crispies, gluten-free rice crispies would also work. You can usually pick those up at any grocery store. Hope that helps! !